New Yorkers are suckers for gluttony—eating too much, drinking too much, and just plain living the life. After all, this is a city where brunching is practically an Olympic sport. As such, we take our day drinking seriously around here; while we're always content to head to our favorite neighborhood watering hole, we seriously love the thrill of the hunt. Venturing out into Manhattan's (and Brooklyn's!) web of neighborhoods to find the perfect spot to get saucy while we wait for the sun to go down is our idea of a perfect Saturday (or Sunday, or Monday, or…you get the point). 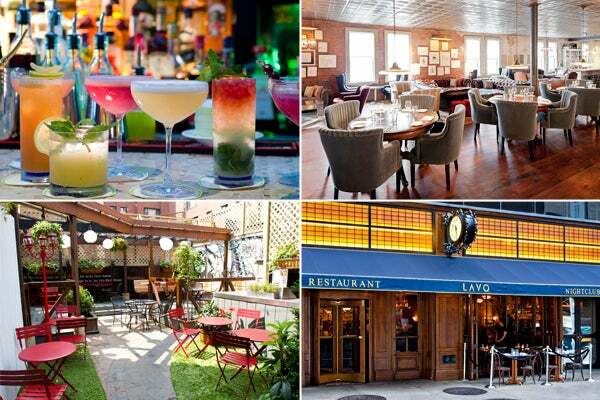 So, in the spirit of giving, we're sharing our absolute favorite places to day drink in NYC. Plus, thanks to the power of social media, we even slipped in some of your favorite spots. We'll drink to that. Head to Yerba Buena if you're looking for a boozy brunch of the more unique variety. Their latin-inspired dishes are heavily praised, and their beverage lineup includes more than your average mimosa — think sangria, and their special YB Cocktail. Yerba Buena, 23 Avenue A (between 1st and 2nd streets); 212-529-2919. A relative newcomer to the day-drinking crowd, Mulberry Project boasts one of the best outdoor patios around. It's a fully enclosed garden oasis, perfect for escaping the rush of the city and relaxing with one of their artisan cocktails. Mulberry Project, 149 Mulberry Street (between Grand and Hester streets); 646-448-4536. Lavo is your go-to spot if you like your sunshine imbibing with a side of club beats, bottle girls, and sparklers. There's no rest for the wicked here, and certainly no chatting quietly with your friends. Lavo, 39 East 58th Street (between Madison and Park avenues); 212-750-5588. If you're lucky enough to be a member here (or, better yet, have a friend who's a member), we're not sure why you'd ever leave during the summer. The rooftop pool, albeit small, is the perfect place to wile away a warm day basking in the sun, and, of course, getting drunk tipsy. 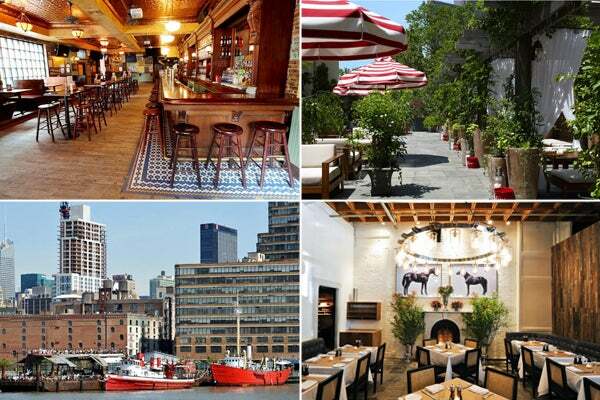 Soho House, 29-35 Ninth Avenue (between 13th and 14th streets); 212-627-9800. Come for the amazing beer selection, and stay for the amazing beer selection. They've got drafts on drafts on drafts of every sud you can dream of — try the 11% Avery Maharaja Imperial IPA, if you dare. Spitzer's Corner, 101 Rivington Street (at Ludlow Street); 212-228-0027. For island-locked Manhattanites, this floating oasis is the closest we can get to a true nautical experience. Drink prices are a little high, but worth the gorgeous views and sea Hudson River breeze. The Frying Pan, West 26th Street and Hudson River, 212-989-6363. By day, this leafy-green outdoor space is a relaxing place to hang with friends. If you manage to stick it out until the sun goes down, they bring in a DJ for an all-out party. The Yard, 310 West Broadway (between Grand and Canal streets); 212-965-3271. The Bowery's preppy-chic hotspot is known for their bespoke cocktails, so feel free to take your day drinking to an extravagant level here. Their outdoor seating provides excellent people-watching, meaning it's worth your while to saddle up and watch the parade of chic New Yorkers go by. Saxon + Parole, 316 Bowery (at Bleecker Street); 212-254-0350. We know, we know — this place is frat bro central. But for Upper East Siders looking for a convenient and cheap (half-price drinks all day cheap) place to relive their youth by pounding pitchers and vodka-red bulls, TSI does not disappoint. Plus, the nonstop flirting that goes on at the beer pong tables provides endless entertainment. The Stumble Inn, 1454 Second Avenue (between 75th and 76th streets); 212-650-0561. A true Hipster haunt, this off-the-beaten-path (literally!) resto has unique décor in spades. Join the cool kids for some afternoon delight, if you can find it. Freemans, End of Freeman Alley (Off Rivington between Bowery and Chrystie); 212-420-0012. Everyone needs a little southern comfort once in a while, and Peels always delivers — sip on one of their four different bloody mary varieties, and nosh on their soft and flaky biscuits when the inevitable drunk munchies hit. Peels, 325 Bowery (at 2nd Street); 646-602-7015. One word: Margaritas. 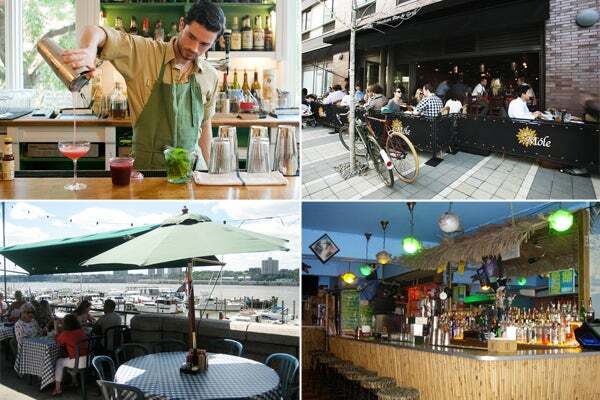 You'll come for the tequila, and stay for the laid-back atmosphere and 'Billyburg people-watching. Móle, 178 Kent Avenue (between South 5th and South 6th streets); Brooklyn; 347-384-2300. If you're willing to hike all the way up to Riverside Park, you'll reap the benefits in the form of a sprawling outdoor boozefest. You can choose to sit right on the marina, or in the bar area, which often caters to a soccer-loving sports crowd. Boat Basin Café, West 79th Street and the Hudson River; 212-496-5542. Otto's is a tiki bar in the true sense of the word. The refreshing frozen drinks feel more appropriate for daytime than, say, a vodka-soda, and the dark, beachy decor will go easy on your eyes if you had a little too much fun the night before. Otto's Shrunken Head, 538 East 14th Street (between Avenue A and Avenue B); 212-228-2240. Ladies and gentleman, we present you with the most authentic bloody mary in all the tri-state — or, at least, in our opinion. The signature drink comes with all the fixin's, and the traditional (but rarely used) beer chaser. Jeffrey's Grocery, 172 Waverly Place (between Christopher and 10th Streets); 646-398-7630.